"Intimate and cathartic" refers to both: the process of making a book and the process of reading. Book as an object encourages intimate interaction between the maker and the object, the object and the reader. Art as an activity veers towards the cathartic experiences between the artist and the object; the object and the viewer. Adding to that a medical context, results Medical Humanities and an approach, which considers artist’s books as a tool to aid healing and facilitate communication between doctors and patients. I was honoured to co-curate Prescriptions exhibition, which is now open until August 14 at The Beaney House of Art and Knowledge, Canterbury. 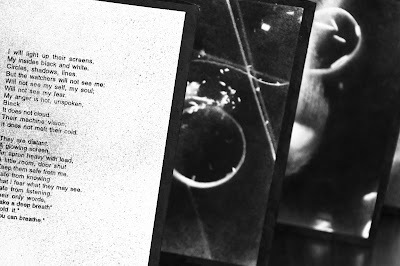 The exhibition is part of Artists’ Books and the Medical Humanities project by the University of Kent’s School of English. 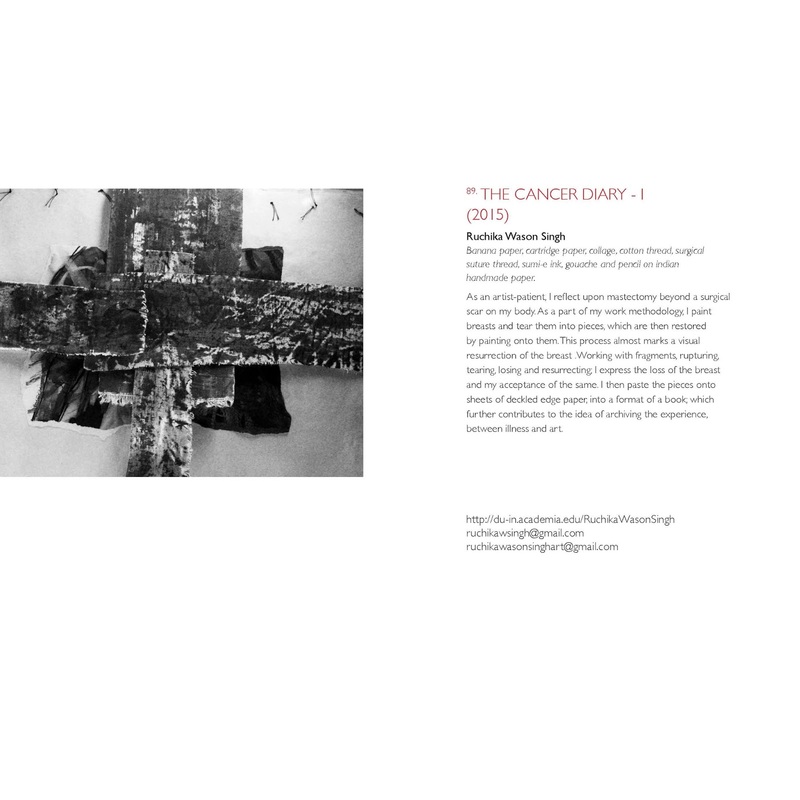 It was originally structured around a set of Martha A Hall’s books, which she created from 1998 until her death in 2003 to document her experiences with breast cancer and interactions with the medical community. To extend Prescriptions further, an open-call was initiated, which resulted in over 200 artists worldwide submitting nearly 250 works, of which 88 bookworks were selected, reflecting on the themes of illness, grieving, disability, mental health, surgery, birth, aging, recovery, history of medicine, treatments and wellbeing. View of Prescriptions at The Beaney, Canterbury. Illness, healing, grief are intimate processes. Like Martha A Hall, a number of Prescriptions artists have responded to their conditions by making books: whether it is their own diagnosis or grieving at the illness of a friend. Like Martha A Hall, 25 of the participants are dealing with cancers, of which 11 are breast cancer patients and further 4 are friends or family of a breast cancer patient. Cancer is one of the twelve constellations of the zodiac. Its name is Latin for crab and it is commonly represented as one. Its astrological symbol is ♋. Cancer is a medium-size constellation with an area of 506 square degrees and its stars are rather faint. Cancer is the dimmest of the zodiacal constellations, having only two stars above the fourth magnitude. Cancer is frequently represented as a combination of five stars. The first star in my Cancer constellation is Lizzie Brewer. 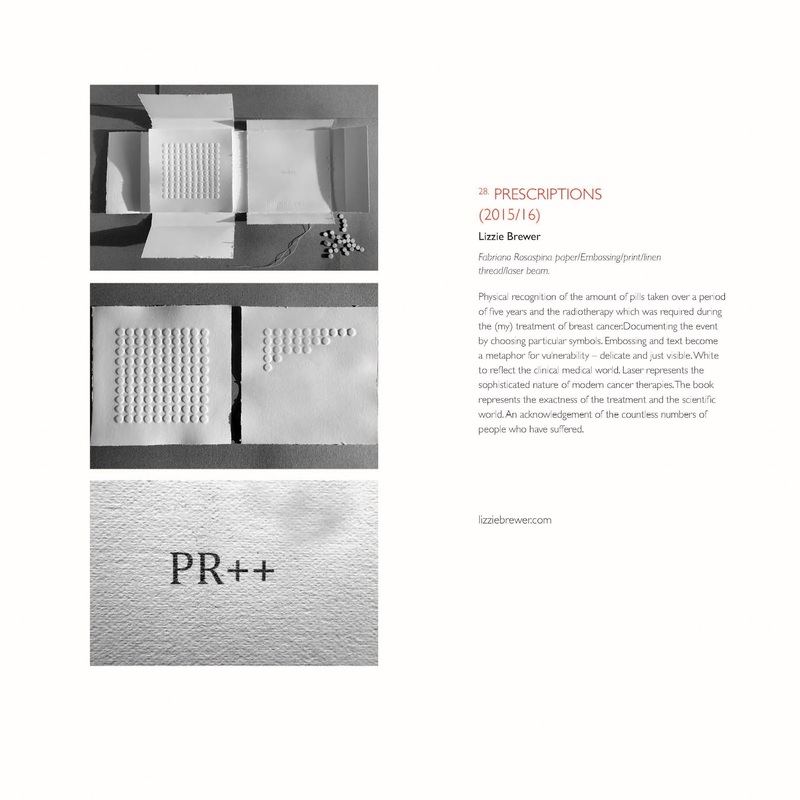 Lizzie's work Prescriptions is a set of embossed prints, which reflect on the amount of pills taken during the five years of her breast cancer treatment. Each tablet is one little step towards healing: her work shows a long journey. 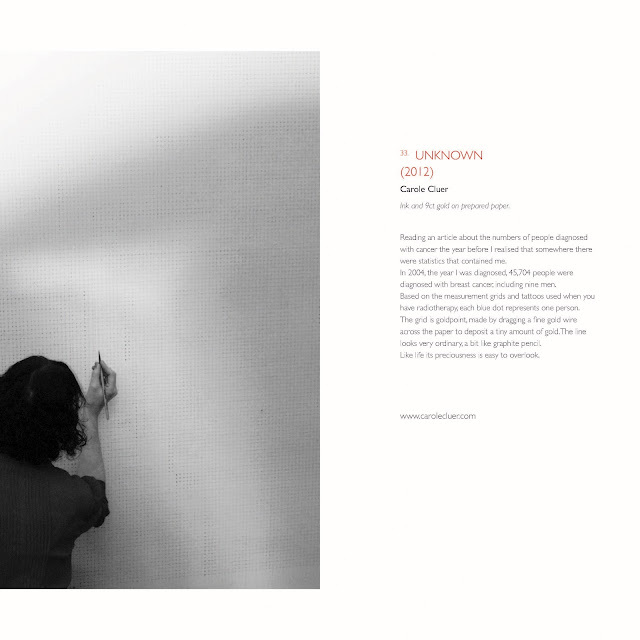 Repetition is what stands out in Lizzie’s work: tablets look the same, pages look the same. There is meditative quality to an ongoing expanse of sheet after sheet after sheet. Other then details of her surgical report there are no other texts and there are no images. The person behind this data is very much absent - repetition hides her like a smokescreen. Carol Cluer was diagnosed with breast cancer in 2004. Unknown is another seemingly detached work, which hides individual well behind volume, number and data. Carole considers the number of people diagnosed with breast cancer in the same year as her. Based on the measurement grids and tattoos used when you have radiotherapy, she had drawn a grid by dragging a fine gold wire across paper, so each dot represents one person - anonymous person - like herself. The books consist of pages and pages and pages of identical looking hand drawn grids: simple to look at, but exquisitely executed. 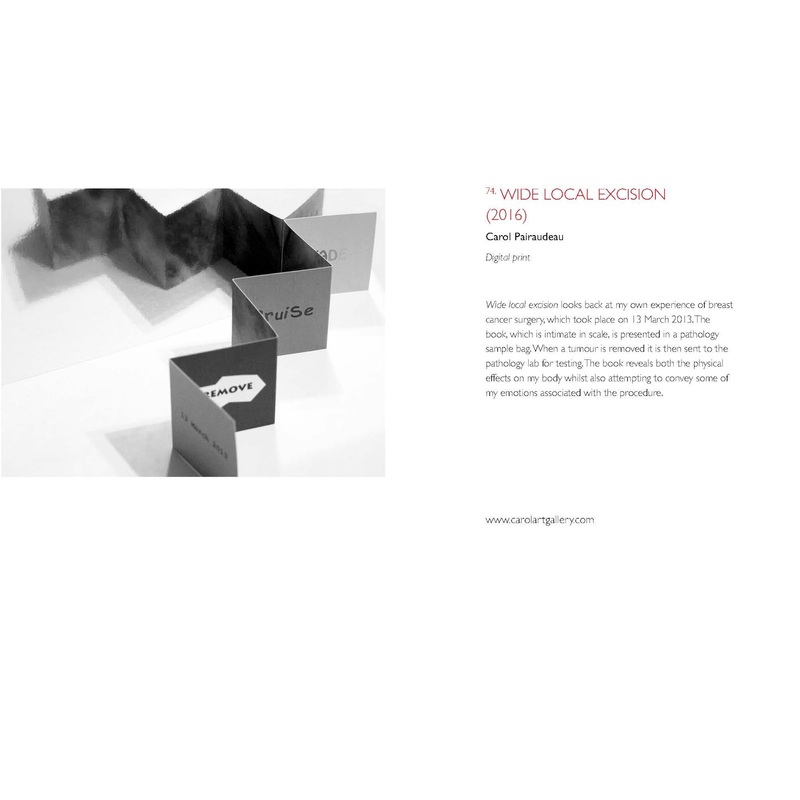 If Lizzie’s work zooms into individual’s experience, Carol’s work zooms out to globalize it, by re-contextualising herself into the worldwide stream of data. If individual is hiding behind the data in two previous two works, Carole Pairaudeau puts herself right into the center of her book. 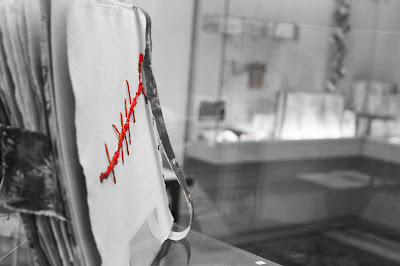 Not only is the work presented in a hospital sample bag with Carole's name printed on it, her book is a concertina, showing her scar and bruising on one side and words (about healing of the scar) running on the other. The photo images of bruised skin are otherworldly in their blues, greens and purples. Their beautiful and painterly quality contrasts with their painful origin. The text complements images: it transports reader through stitch to fade of the scar in three concertina folds, producing six steps. Like in Lizzie’s work, Carol’s work is about time and healing. The steps might be bigger and may take more time of complete, but the work feels cathartic and emotionally true. Ruchika Wason Singh builds her book as a journey of acceptance at the loss of her breast. Physical and emotional healing is replicated in her creative process. Ruchika paints breasts and tears them into pieces, which she then restores by painting onto them. She resurrects the breast visually as she completes her inner transformation into an honest acknowledgment of her situation. Ruchika then pastes images onto sheets of paper to form a book, which further contributes to the idea of archiving the experience. Her set of collages is loosely held together by fabric, resembling bandages. The cover image is a stitched scar. The book is wholesome, bold and honest. Ruchika’s work elicits anguish and grief that feel resolved as the book is closed. A photo book by Mara Acoma documents her own experience of having her mother diagnosed with breast cancer. The work, Mara says, allowed her to demystify her own emotional journey. 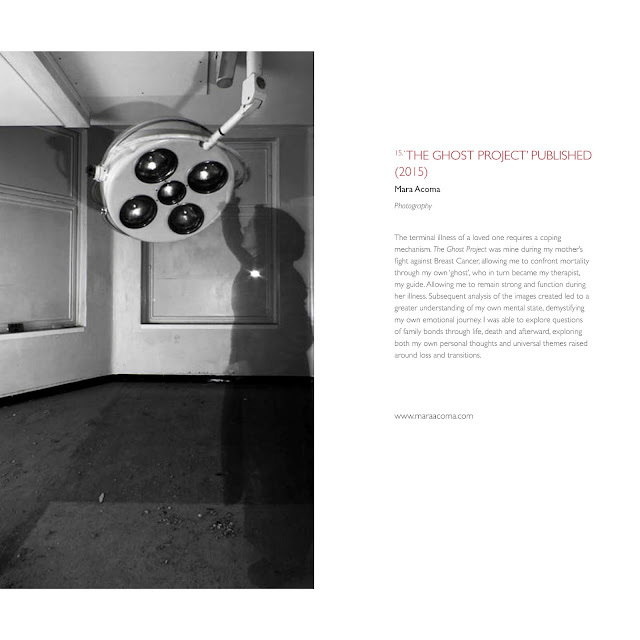 She is using the visual language of near death experiences and folklore surrounding ghosts. The images are dark, produced to the backdrop of gothic sets of crumbling castles, gloomy forests, abandoned hospitals and misted up windows. A lone ghost of a heroine is moving from one location to the next across sprawling spreads of large size monochromatic photographs. Those imaginary locations represent her mental states, which - like Lizzie’s tablet’s or Carole’s bruises - are steps towards emotional healing. Intimate and cathartic is a diary for the writer, as it is for the reader. The books above are diaries in the most generic sense of the word. They are non-verbal diaries. Their authors reach beyond language to say the unsayable. The (almost) lack of language evokes universal readability of the artwork, which in turn, resonates with universal concerns of understanding illness and understanding healing as a process.